This Marble Vanity Sink is called "The Lorraine." 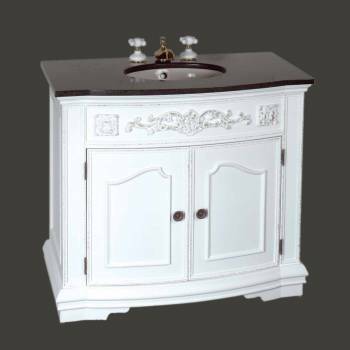 The Lorraine is an Antique Victorian Vanity Sink With a Heavy Duty Maderabond Cabinet and Black and Green Marble Top. The Vanity has a built in Vitreous China Basin which includes an overflow hole and the Counter Top has Widespread Faucet Hole boring. The Faucet is not included. The Dimensions are 37" Wide, 33 1/4" Tall, 20" Projection. This is a well made heavy Vanity Sink, the weight is approximately 200 lbs. Add this elegant centerpiece to your bathroom, you won't be disappointed.